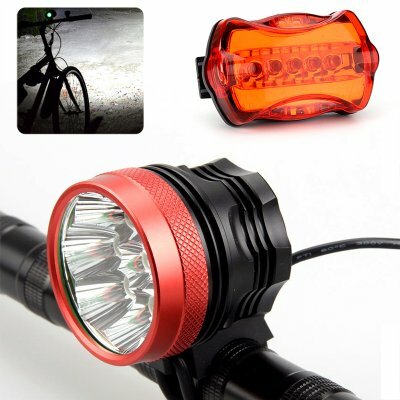 Successfully Added CREE XM-L T6 LED Bike Light Set - 15000 Lumen, Front And Rear Light, Quick Fitting, Head Strap, Rechargeable Battery to your Shopping Cart. This CREE LED bike light set is guaranteed to keep you safe when heading out on your bike after dark during the cold winter months. Including both a front and rear light this LED bike light set guarantees that you’ll be clearly visible on the road. Illuming a massive 15000 lumens of light this CREE headlight will light up whatever lays in front of you, providing you with a clear view of what lays ahead while at the same time guaranteeing that your surroundings are aware of your presence. Coming with a high-end aluminum body this bike light is extremely durable and is designed to withstand tough environments. Weatherproof ratings assure that this CREE headlight along with the bike tail light can be safely used in any weather condition. Whether there is rain, snow, or fog – with this CREE bike light nothing will hold you back to head out after dark. Packing a substantial battery case that lets you add 4 x 18650 rechargeable batteries (not included) so this LED bike light set brings countless hours of illumination, ensuring that you won’t be left in the dark when cycling back home after enjoying a fun night out with your friends. Featuring three different light modes this LED light allows you to easily switch between high, medium, and low light with the touch of a button – ensuring that no matter the weather or light conditions, you will always have the right amount of light available to arrive safely at your destination. The front light of this LED light set can be either attached to your steering wheel or, along with the included headband; it can be used as a headlamp. Allowing you to wear this powerful LED flashlight conveniently at your head makes this a truly multifunctional flashlight that can be used for countless purposes. Whether you go out for an evening hike, a bike ride after dark, or simply need some extra light while camping – with this CREE light set you are guaranteed to be never again left in the dark. This LED Bike Light Set comes with a 12 months warranty, brought to you by the leader in electronic devices as well as wholesale electronic gadgets..
Arabic: - ضوء LED الدراجة - Chinese Simplified: - LED 自行车灯 - Czech: - LED Bike Light - Dutch: - LED fietsverlichting - French: - Lumière LED vélo - German: - LED Fahrrad Licht - Hebrew: - אור LED אופניים - Hindi: - एलईडी बाइक प्रकाश - Hungarian: - Kerékpár LED fény - Italian: - Luce LED bici - Japanese: - LED 自転車ライト - Korean: - LED 자전거 빛 - Malay: - Lampu LED Basikal - Norwegian Bokmål: - LED sykkel lys - Romanian: - LED biciclete lumina - Russian: - ПРИВЕЛ велосипед свет - Spanish: - Luz LED bicicleta - Thai: - แสงจักรยาน LED - Turkish: - LED Bisiklet ışık - Vietnamese: - Ánh sáng đèn LED xe đạp. Product looks and feel premium. Main light is very bright and functions well in dark. No instruction manual so very difficult to fit it on bicycle.